Its easy to appreciate the beauty of a beach in Hawaii, with its electric blue waters lapping over a coast of golden sand. But hidden in plain sight is a devastating reality, captured in a video by Sustainable Coastlines Hawaii. 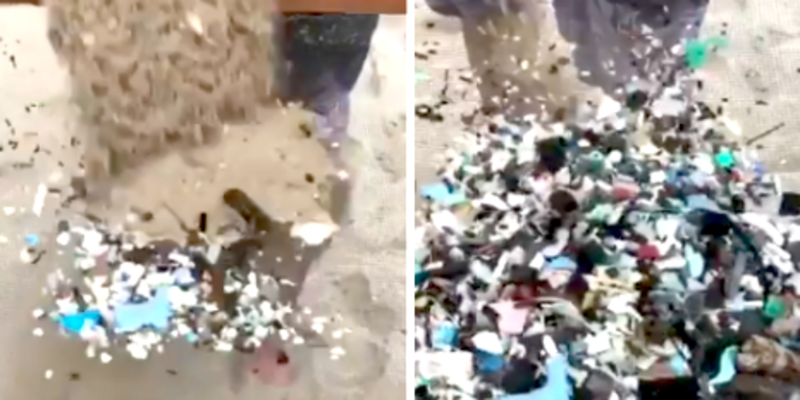 During a recent beach clean up in Kailua on the island of Oahu, the nonprofit group used a sand sifter to rid the sand of trash and plastic pollution. They filmed theslow-motion videobelow of the sifter in action to show people just how much harmful debris sits within the sand. Among leftover twigs and shells is a shocking amount of plastic debris particles. This example from Kailua Beach in Hawaii shows what it could look like if you were in a highly polluted region, ocean advocacy group Take 3 For The Sea wrote on Facebook. This beach sits on the windward side of Oahu meaning plastic debris from the #greatpacificgarbagepatch washes up regularly on the onshore trade winds. But its only a small glimpse into the oceans giant plastic pollution problem. An estimated eight million metric tons of plasticmakes its way to the sea every year, according to a 2015 study.And all that trash harms the environment and wildlife in a variety of ways. Sea turtles have been found in the ocean with plastic forks and straws rammed deep into its nostrils. Whales often become entangled in fishing line, hindering their hunting, swimming and, sometimes, causing them to starve to death. In February,researchers found 30 plastic bags, candy wrappers and other garbage, inside the belly of a beached whale. Whats more, when fish consume plastic or microplastic (plastic pieces that are smaller than five millimeters), they also absorb the toxic chemicals contained in the digested debris.Some of those toxic chemicals may end up in the seafoodhumans consume. Plastics when they end up in the ocean are a sponge for chemicals already out there, Chelsea Rochman, researcher at the University of California, Davis, told NPR IN 2013. We found that when the plastic interacts with the juices in the [fishs] stomach, the chemicals come off of plastic and are transferred into the bloodstream or tissue. Thats why organizations like Sustainable Coastlines Hawaii hold monthly beach clean ups and share their collected debris online: to put a dent in the global plastic pollution problem and to let the world know whats really hiding in the sand.